A couple of months ago, I made a promise to myself (and the universe) that every week, I would send something out to some kind of short story/send-us-the-first forty-pages-of-your-novel/creative-non-fiction-give-us-your-best-2000-words-essay contest. Because I am lazy, I limited my submissions to magazines and journals that accepted submissions via emails. I also started to pray. "Please, God," I prayed. "Please, please, please, get my short story published." The fact that I hadn't written a new short story in over a year was just a detail. Once I made my promise, I actually started to rewrite bits and pieces of things and started work on a story about losing someone you hadn't seen in a long time. 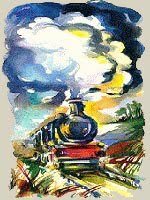 The story wasn't finished but the deadline for Glimmer Train's "Short Story Award for New Writers" was looming so I finished the story as best I could and emailed it off. I love Glimmer Train. The sisters who run it sound so nice, the bios they run of their writers often include baby pictures, and many of the short stories they publish are actually readable. Besides, there's something about the notion of a "glimmering train" that is just so delicious. I prayed for publication. I prayed hard. 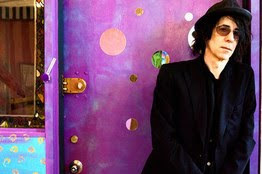 I started to listen to Peter Wolf's album, "Midnight Souvenirs." I have to admit, until a few weeks ago, I had no idea who Peter Wolf was (except to vaguely confuse him with Prokofiev's symphony Peter and the Wolf.) But after a semester of getting my business journalism students to write stories about companies, during the past couple of weeks, I have been trying to get them to read and write business stories about people. I found an interesting story about Peter Wolf in the April 2nd issue of The Wall Street Journal. One of my students is the lead singer in a punk rock band, and the rest of the students always seem to be plugged into their ipods, so I assigned the story to them. Wolf was the lead singer of the J. Geils band, most famous for the songs, "Love Stinks," "Freeze Frame" and the 1981 hit, "Centerfold." If you remember that song, you remember how ridiculous and great it was. I used to know all the words. Since the band broke up, Wolf, now 64, has been kicking around, making solo albums, and working with people like Keith Richards and Mick Jagger, but he hasn't had the same crazy success he had early on. His last album, "Sleepless," came out eight years ago and sold just 40,000 copies. Still, he sounded like a thoughtful guy in the Journal story. He's a successful painter and his mother was an opera singer, so I figured he was probably a talented singer-songwriter, if not a great businessman. His new album is really, really good and gets better as you listen to it. In some of the songs, Wolf sounds like a cad with a bad attitude and a good sense of humor. In others, he sounds like a romantic guy with a beautiful voice, still trying to drum up love in upper middle age. You can go to www.glimmertrain.org and click on the “Top-25” on that page. The announcement will also be made in the emailed September bulletin. If you don't already get our bulletins, ask your email server to put mail.glimmertrainpress.com on your safe-sender's list, or you can check the bulletin archives after the 10th of the month. Thank you again for letting us read your work--it is a pleasure! My story wasn't getting published, and I hadn't actually received anything except a nice email, but I was still ecstatic. I immediately forwarded the email to my agent, my mother, my husband, my brother, my best friend from college and my sister-in-law. No one emailed me back. I called my husband and my brother. Neither answered. Finally, my brother called. I gave him the news. "So what does that mean?" he asked dubiously. "Well, I'm not getting published, but I am getting acknowledged." "Hmm," he said. "Hasn't that happened before?" Yes, I confessed. A couple of years ago, one of my short stories had been selected for an Emerging Writers Competition in Chicago, and I had flown to Chicago at my own expense to read it out loud in an apartment above a sewing machine shop. The story had been pod cast, which is sort of like saying you've read your story out loud, somebody taped it and the tape is floating around the Internnet somewhere. "Story of my life," I said. "That would be the name of a good short story!" my brother exclaimed. It would be, except Jay McInerney already published a novel with that title in 1988. When my younger son got off the bus, I told him that I was one of the top 25 finalists in a short story contest. "How many people entered the contest, Mom?" he asked. "Because if it was 26, then that's not so amazing." I had no idea how many people had entered the contest. "Did they rank the top 25?" he asked as he looked down the list. "There you are," he said, pointing to my name. I was ninth. "I think they just alphabetized them," I said, since the list started with Caroline Arden and ended with Tony Zito. I printed out the list of finalists and left it on my desk. Then I went to a doctor's appointment. When I came back, I told my older son. I felt a little weird, bragging to my kids about what was really just a congratulatory group email, but I'm constantly urging them to try out for things/ give things a shot/go for it! Here I finally was, going for it! via email. "I know," my older son said. "I already saw it on your desk. I'm happy for you." "awesome job mom! congrats. and yes, my hair is still long." His post actually gave me a shred--oh hell, a glimmer---of hope as I sipped my coffee. Acknowledgement now, publication imminent. Awesome job sistah.